Work Permits Adventure Immigration Services Inc. The Immigration and Refugee Protection Regulations (IRPR) specifies that the worker class is a class of persons who may become temporary residents. A worker may be authorized to work without a work permit R186, or may be authorized to work by the issuance of a work permit pursuant to Part 11 of the Regulations. Section R2 defines Work as an activity for which wages are paid or commission is earned, or that competes directly with activities of Canadian citizens or permanent residents in the Canadian labour market. self-employment where the work to be done would have no real impact on the labour market, nor really provide an opportunity for Canadians. Examples include a U.S. farmer crossing the border to work on fields that he owns, or a miner coming to work on his own claim. There may be other types of unpaid short-term work where the work is really incidental to the main reason that a person is visiting Canada and is not a competitive activity, even though nonmonetary valuable consideration is received. For instance, if a tourist wishes to stay on a family farm and work part time just for room and board for a short period (i.e., 1-4 weeks), this person would not be considered a worker. 48 months have passed since you accumulated 4 years of work in Canada. 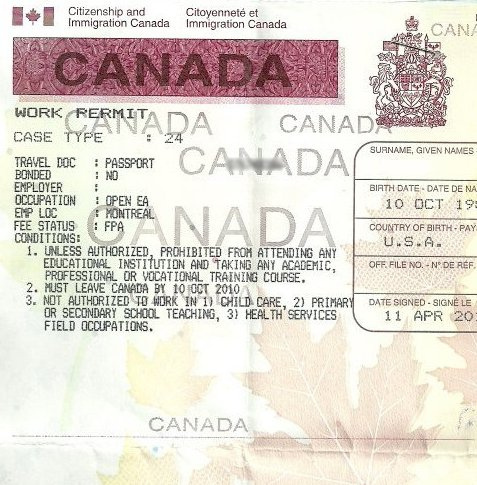 any other document that demonstrates that you were not working in Canada while on a work permit. A Labour Market Opinion (LMO) is the opinion provided by Human Resources and Skills Development Canada (HRSDC) to the officer which enables the officer to determine whether the employment of the foreign worker is likely to have a positive or negative impact on the labour market in Canada. A LMO may be required in order for a work permit to be issued. The LMO process begins by the prospective employer submitting an LMO application to the HRSDC. The HRSDC will consider several factors, including the availability of Canadians and the offered wages as well as the economic benefit the foreign worker would bring to Canada. HRSDC will then provide its opinion to the CIC. The LMO is typically given for a specific period of time, and the work permit issued will coincide with that period. Renewal of a work permit beyond the specified period will likely require a new LMO. whether or not, over the past two years, employers who have hired foreign workers, provided wages, working conditions and employment in an occupation that were substantially the same as those listed in the offer of employment. Canadian employers who would like to offer a permanent job to a foreign national wanting to immigrate to Canada can support their application for permanent residence and facilitate Arranged Employment with a qualifying job offer under the Federal Skilled Worker Program (FSWP) or Federal Skilled Trades Program (FSTP). Canadian employers who would like to offer a job to a foreign national wanting to work on temporary basis in Canada can do so with a qualifying job offer under the Temporary Foreign Worker Program (TFWP). The foreign national can be either a Temporary Foreign Worker (TFW) already in Canada, or someone abroad. As the Temporary Foreign Worker Program is designed to help employers fill short-term gaps in Canada’s labour market, most temporary foreign workers are limited to working in Canada for four years before having to return to their home country. Most Temporary Foreign Workers have the opportunity to apply for permanent residence if that is their desire, and limiting the amount of time they may work in Canada with a temporary status encourages them to do so. For all other types of work, you must apply for a work permit which either requires LMO (R203) or is LMO exempt (R204, R205, R206, and R207).